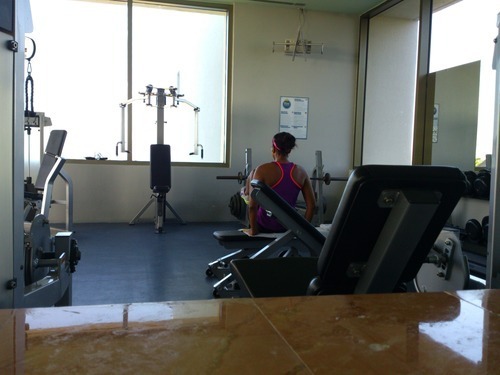 I always to try to find a way to squeeze in a workout while on vacation, after all I am in a bathing suit most of the time! Many hotels have a gym which I try to take advantage of, (see above) however if gyms are not your thing or you are looking for other alternatives check out my suggestions below. hiking trails and much more! Take a run on the beach: If you live in the New York area like I do there aren’t many opportunities to have a morning run on the beach. Take advantage of this unique situation and run on the beach at least once during your next vacation. Channel your inner mermaid and swim: Most of us just float around in water with a tropical cocktail but why not actually utilize the pool and swim?! Depending on the time of year you are traveling the pool can get kind of cramped, I would suggest an early morning swim so that you can enjoy the rest of the day. DANCE: This is my favorite way to burn calories during vacation and on a regular basis. There are tons of opportunities to show off your moves, do not waste the opportunity.